How long does it take to grow from the kit with the 1 liter starter bottle, until I can start harvesting from my tank? 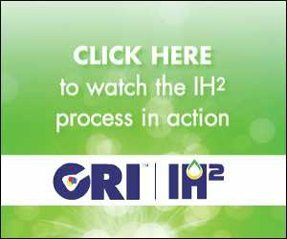 Grow-up proceeds in stages—see the instructions; you put half the contents of the bottle into one quarter of the tank (2.5 gallons for a 10-gallon tank) to start with, which results in a very thin culture at first, which will thicken over time. After a couple of weeks, the algae should be thick enough that you can double the culture volume, then after a week or so, double again, so that the tank is full. Once the tank is full, the algae are thick (3cm Secchi or less, see below), and the pH has been at least 10 for 24 hours, you should be able to harvest. This process can take from 3 to 6 weeks. 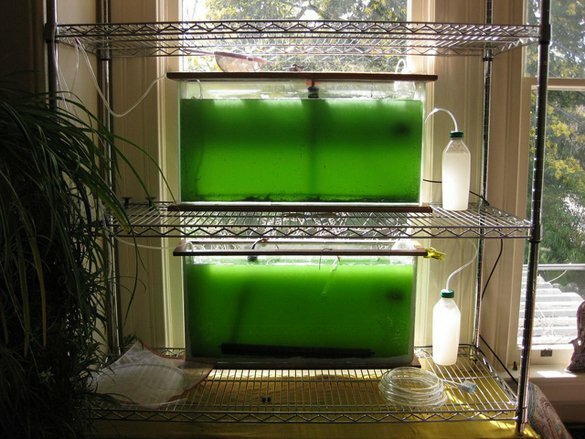 Once you have a thriving culture (which typically takes a few weeks), you can harvest from it regularly (how often depends mostly on how much light the algae get, the more the better); each time you harvest, you add a little Make-Up Mix to the culture to make up for the nutrients that are taken out in the harvested algae. What kind of water should I use to make the growth medium? We use tap water, filtered through activated carbon (such as a Brita) or through a ceramic filter (such as a Berkey). 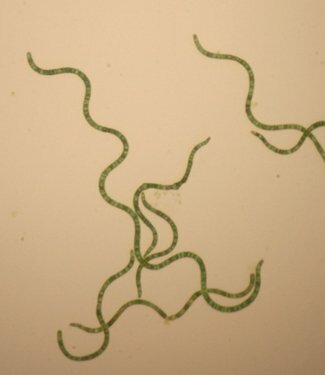 Algae are quite sensitive to chlorine (which is why it’s used in the first place! 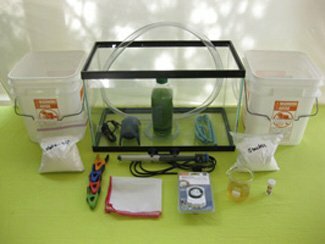 ), so tap water is only usable if the chlorine has been removed—which can be done using products sold for fish aquariums. The afore-mentioned filters, and de-chlorination, leave minerals in the water, which is generally a good thing; if you want to use de-mineralized water such as distilled or reverse osmosis water, or if your water is particularly soft, you may get better growth if you add some combination of 0.1 g/L magnesium sulfate, 0.5 g/L potassium sulfate, and/or 0.1 g/L calcium chloride (or lime or plaster). That said, we have yet to hear of anyone having trouble growing in non- or de-chlorinated drinking water of any kind. 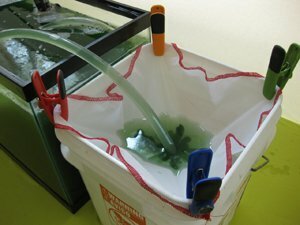 How much Spirulina will I be able to harvest from my tank, how often, and for how long? If you follow the instructions and thus provide proper temperature, pH, and nutrients, yield will depend mostly on the hours of bright light the tank receives. This generally means sunlight. (See below for a discussion of artificial lighting.) In a south-facing window with plenty of direct sun exposure, you can get roughly a tablespoon of live Spirulina harvest from a typical 10-gallon tank every other day. Two or three such tanks (or bigger) can fit in a window for daily harvest. For how long? If the proper amount of make-up mix is added back to the tank after every harvest, the nutrient balance can be maintained for a high level of growth for about four to six months, at which point the pH will have risen too high (11+) for good growth. At this point you simply mix up a new batch of medium, harvest all your Spirulina, and immediately put them in the new medium. After a couple of weeks your culture should be full, dense, and ready for harvest again, ready to start the 4-6 month cycle. So, you need enough starter mix to renew your culture every 4-6 months, though it’s a good idea to keep some on hand in case anything else might go wrong with your medium (though this is unusual). There is no reason why you shouldn’t be able to keep going this way indefinitely. The formulae for the starter and make-up mix are in the instructions if you want to make your own. How do I use the Make-Up Mix? As described above, the make-up mix is used only at harvest time (or when removing dead algae). Add an amount of make-up mix proportional to the harvested algae—one teaspoon of the mix per tablespoon of harvested algae, plus a dash of iron juice. This makes up for the nutrients lost in the harvested algae, thus the name. How do I keep my Spirulina alive when I go on vacation? Can they be “parked” for a while? The trick is to slow down their metabolism by lowering the tank temperature. This can be done simply by turning off the heater. The tank should also be kept from strong direct light during this time as well, although it does need some light. If kept in this way, it should be fine for several weeks or more. When bringing it back from this state, raise the temperature and light in stages, over a few days, and the algae will be fine. 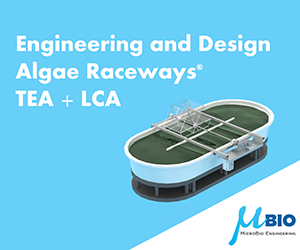 Can I use artificial lights to grow my algae? Some algae-nauts have had good results from using artificial illumination, but it’s worth remembering that direct sunshine is about 100x brighter (~100,000 lux) than the light in what would be considered a very well artifically-lit room (1000 lux). It’s hard to compete with the sun. If using artificial lighting, it’s smart to take advantage of the heat generated by the light fixture as well. See below for a discussion of the optimal color for an artificial light source. Do I need to tell you to be very careful about combining water and electricity? Watch for dripping water going along power cords – keep plugs high so you won’t get shocked! What are the health benefits of eating Spirulina? Too many to mention here; take a look around the Web for a more complete picture. In a nutshell, because it lacks a cell wall or any other indigestible components, Spirulina is a super-concentrated, highly available nutrient source, which enhances the nutrition of any food eaten with it. Spirulina is about 65% complete protein, and the remainder is packed with anti-oxidants, essential omega-3 fatty acids, and other compounds with healthful anti-inflammatory, anti-viral, and anti-cancer properties. 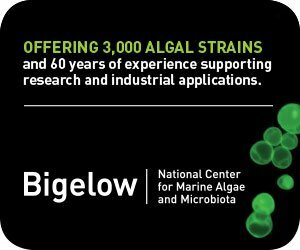 As a blue-green algae, its nutritional value is unique, since blue-green algae split evolutionarily from green plants approximately a billion years ago. My experience with Spirulina (I eat about 15 grams a day) is that it greatly improves my stamina, raises and levels out my mood, and speeds up all kinds of healing. The first two effects are consistent with clinical studies that show a large reduction (up to 50%)in the glycemic index of foods eaten with even a small amount (2.5%) of Spirulina. Is live Spirulina better for you than the powder or pills I can get at the health food store? All studies of the health benefits of Spirulina have been on the dead, powdered stuff. I believe that the live, fresh version of such a highly perishable food would have superior properties, and this is my experience, having eaten both. Purveyors of the powder claim that they take every precaution to preserve the nutritional properties of the algae, but what would you rather eat, a fresh blueberry, or a powdered blueberry? How long does the live, fresh Spirulina last? How can I preserve it? Fresh Spirulina, once removed from the preserving alkaline environment of the tank, is like raw eggs in its perishability—it should be eaten or refrigerated within an hour or so of harvest. It will last in the fridge for up to three days. If frozen, it lasts indefinitely; if dehydrated (and kept dry), it will last for about a year, longer if kept in an airtight container. It’s not hard to tell if it does go bad—it smells like rotten eggs. 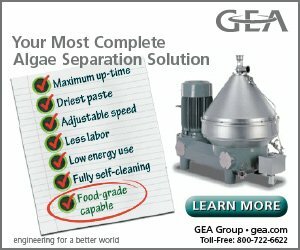 Is there an optimal artificial light to use for growing Spirulina? As a general rule, a plant or alga (or anything else for that matter) absorbs the wavelengths (colors) that are not present in its apparent color, which is made up of the wavelengths that it bounces out without absorbing. So, the chlorophyll of green plants absorbs mainly red and blue light, and bounces out green light. Green plants need both red and blue light to thrive. Blue-green algae, such as spirulina, have special accessory pigments called phycocyanins and allophycocyanins, which allow them to capture more red and orange light (and to a lesser extent yellow and green) than green plants. They do have chlorophyll (only slightly different from green plants’ chlorophyll), so they also use blue light. For these reasons, ordinary “grow lights”, which are optimized for green land plants, are not particularly good for growing Spirulina or other blue-green algae (though they will work). A light with more red and orange light—i.e. a “warmer” color—would be more efficient for growth, as a higher fraction of the light will be absorbed. Another approach would be to use white light supplemented by a red-orange light source (peaking at 620-650 nm), to hit the phyco-pigments better. I have used the “warmer” colored compact fluorescents with some success, but haven’t done any side-by-side testing. In general, though, the color of the light source is not as important in my experience as getting the nutrients and temperature right, and providing LOTS of light, which is a lot easier using sunshine!